If your iMac SuperDrive has stopped working or is no longer reading disks, iMac SuperDrive replacement at HK Computers is done in a few hours. We are a true nationwide provider of iMac SuperDrive replacement, Laptop professional repair services as well as iPhone repair. Besides repairs at our iMac services, Laptop repair, PC Computers and laptop repair service center in Bellville Cape town, we have replaced iMac SuperDrives for customers all over South Africa including Johannesburg, Pretoria, Durban, Kimberly, Bloemfontein, Port Elizabeth, Polokwane, Pietermaritzburg and Nelspruit plus many other South African cities. We can usually install your new superdrive in a few hours. 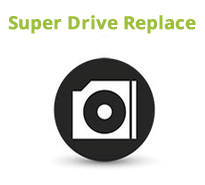 The service price includes the labor cost of installation of your new superdrive. The cost of the superdrive is not included.